The foreclosure process starts when a lender files a complaint against the property owner because the homeowner has defaulted on the mortgage loan. The lender may begin the process of foreclosure in order to rectify the debt. In this case, after filing a complaint, the lender may arrange a foreclosure sale of the houses and auction it off to the highest bidder. Buying foreclosure houses can be an excellent way to obtain a house for a price below its market value. 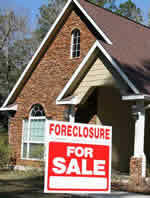 ForeclosureRepos.com has gathered a database of over 500,000 foreclosure listings nationwide. As a member, you will have unlimited access to this listings as well as 24/7 customer support, and valuable information to help you find the best foreclosure houses available. Whether you are an experience investor or a first time home buyer, ForeclosureRepos.com makes it easy for you to locate foreclosure houses. Sign up for our 7-day-trial and start searching for foreclosure houses in our vast database today!